Right in early childhood piety needs to be taught to children; but even in early childhood children are very different from each other in their attitude to piety. Some seem naturally pious, or at least naturally interested in religious things, or naturally devout and reverent; others seem wearied and troubled by piety, are restless under it, irked by it. These are merely natural traits of temperament and do not really mean very much. Those who are restless at prayer are, as often as not, restless anywhere; anything that calls for initiative, as prayer does, makes them uncomfortable. They are difficult at occupying themselves, entertaining themselves; they must be entertained by others, need to be amused, cannot amuse themselves. But it does not always follow that restless children are of this character. Sometimes the reverse takes place. Sometimes it is those who need to be entertained who relish churchgoing. Their temperament is satisfied by what they look at. So it seems to be impossible to decide why some children are naturally pious and some are not. Certainly it is not always a continuing interest. Some begin like that and end very differently; some never seem to have a love of piety in childhood and yet have it in youth. This early attraction or distaste for religion can be well set aside as of no absolute importance. What mothers have to do certainly is to study their children; each child is different. That is the beauty of a home, that children can be studied individually and with sympathy. In nearly every family, for instance, there is one who is different from the rest. However, the point to be realized is the delicate way in which mothers have to deal with each child in teaching it religion. First, the mother has to insist upon religion, not as a matter of liking or not liking, but as a matter of duty; yet the duty must not be made distasteful. Religion of itself is interesting to a normal child. First a child is curious for information. It wants to know things. Hence catechism can be made most interesting to a child. But this depends on the teacher. Some questions and answers should be learnt by heart. Not all of them need be, for not all of them matter. Some certainly do. But the child should not be burdened in its learning. Here, then, is the delicacy of the business; on the one hand the child should not be plagued with religion, on the other hand the child should be taught to recognize the demands of religion as of a duty, over and above mere liking and disliking. Merely because it does not want to pray, it should not be excused from praying; merely because it does not want to obey, it should not be excused from obeying. It needs to be taught prayer in such a way that it shall find prayer interesting. The Rosary is often meaningless, and worse, to a child. A decade is as much as it can manage at any one time. The character of Christ, on the other hand, can always be an inspiration to a child; the stories of the Gospels, the scenes, the parables, His patience, courage, endurance, fortitude, fearlessness, His love of birds and flowers and the harvest, His choice of carpentering His love of the sea and the hills and of gardens at night for praying in, His forgiveness, all can be of interest as well as help to a child. With all these he should be familiar at his mother’s knee. She can teach him to pray by showing him how to form his own prayers, how to ask and thank and praise, how to be silent and listen, how to gaze at Christ. She will have no difficulty in explaining the Blessed Sacrament to him, or the Incarnation; she should have no difficulty in guiding him how to talk to God-which is all we mean by prayer. But talk here also includes silence and contemplation, for a child is born a contemplative usually. It wants so often to look and be still and say nothing. Let it be helped to do that. But no one can teach except what he has learnt himself. No mother can teach prayer who does not practice it. No one can give what he has not got. Purity must be taught. But purity is not the opposite to impurity. Purity is the thing in itself, impurity is its lack. Purity is the positive dedication of love to Our Lord in such wise that love is not killed, but cleansed. To love God is not to deny the need to love man, still less the need to love a man, a woman, a child. Purity means that the love of God helps us to love other people, and not merely to love ourselves in other people. To love passionately may be to serve self only. To love passionately is sometimes to love the passion of love, its thrill, its stir, the pleasures it gives us, and not really at all the apparent object of our love. Thus to love passionately may be only to love self, not another. Passion can go hand-in-hand with decent, pure love, will be found nearly always to some degree in all love, but it can easily usurp love’s place, if we love merely to have the pleasure of loving. Love is not the same as pleasure; love is as much at home with pain. But purity means that Our Lord’s friendship is a third in all our friendships. Into our human friendships the body enters as well as the soul. That is as it should be. We are compacted of body and soul. This love that involves the body in it will not hurt us, for Our Lord can be remembered as present in every moment of every lawful love. The Church has even a blessing for the marriage-bed. For marriage is not something to look down upon, but something to be looked up to. It was the Manicheans and Albigensians who taught that the marriage act was unclean; and yet the Church has been condemned by many for persecuting them, for wishing to exterminate them. No doubt to exterminate them was a drastic remedy to apply to their disease; but the occasion infuriated Mother Church. She believed in the Incarnation. She believed that matter could be hallowed, that the sacraments were holy, that marriage had been blessed with a sacrament, that to decry the marriage-act was blasphemy against the Creator of mankind. For that reason she was bitterly intolerant. Yet in our time such is the ignorance of people that they accuse the Church of teaching what she condemned as worse than heresy seven hundred years ago. 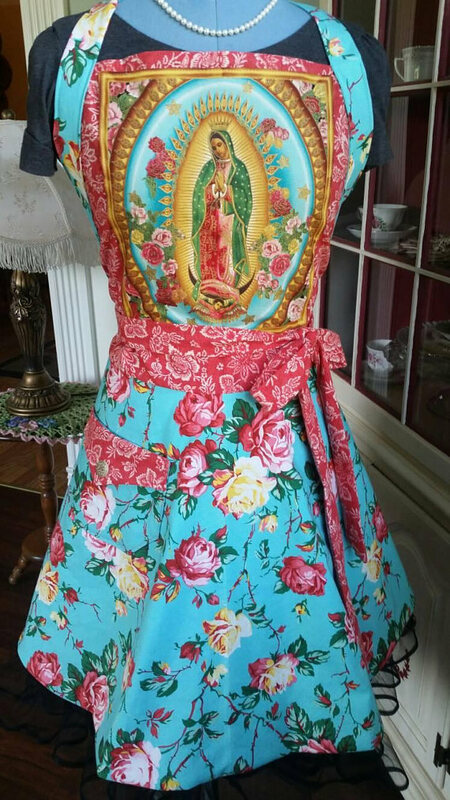 Rose in Bloom Apron! Feminine and Beautiful! Fully lined, quality material, made with care and detail!